Bringing the market home is an art project in which the value of financial shares is used to regulate the operation of various everyday objects and situations. The value of companies and their shares has at once a powerful influence over our everyday lives, and is yet hugely removed. If a trader in New York reacts to a shock headline, 10,000 jobs could be lost in a suburb of Buenos Aires. This project attempts to establish a physical connection (or make that connection more explicit) between the trading actions in finance markets in certain corners of the world, and everyday situations in other parts - with those same seemingly arbitrary shifts. The aim is to compress the chain reaction of market movements on other economic and social systems right down to a few seconds. 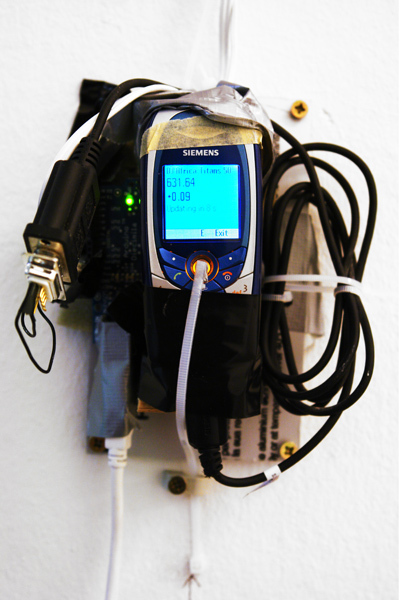 These connections are produced through the use of a custom built device which uses a GPRS capable mobile phone to read live online financial data feeds, and which in turn controls an everyday object, such as the lighting circuit in a corridor. These interventions interrupt the operation and usage of this device for the viewer, potentially causing an inconvenience. The device reads the Dow Jones Africa Titans 50 index, which ‘measures the stock performance of 50 leading companies that are headquartered or generate the majority of their revenues in Africa.’ The device was made together with software engineer Hamilton Gross. In the version shown here, the light operates when the Dow Jones Africa Titans 50 index rises, and is off when it falls. 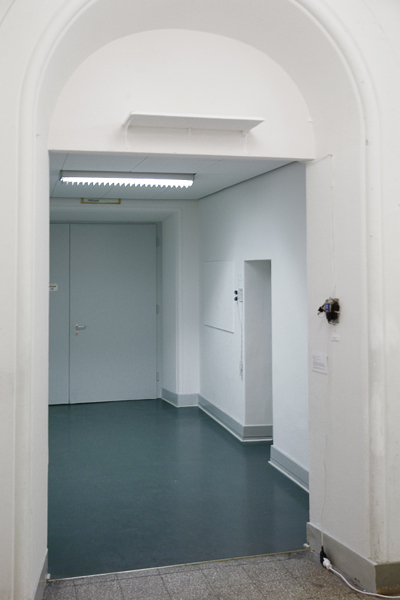 Key to remember is that the device is embedded in the space, so there is essentialy nothing to 'look at' - the intervention is made into the existing space. 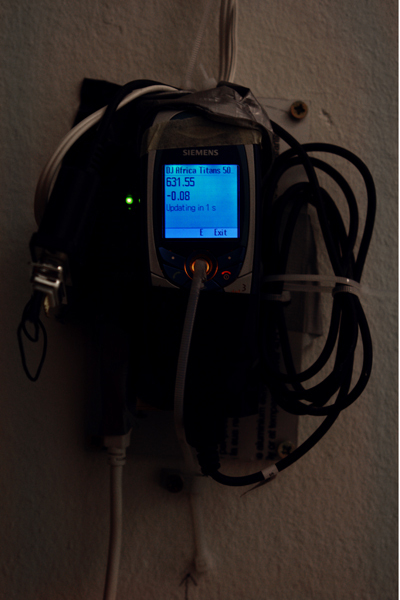 A second version of the device was also installed in the main hall of the Haus der Kulturen der Welt (House of World Cultures) in Berlin in late 2011, in the exhibition Tracing Mobility.